As innovative dentists in Sydney, the team at Pitt St Dental Centre emphasises preventative dentistry to minimise dental complications later in life. Taking good care of your teeth, mouth and gums often results in enhanced health and overall wellbeing. For teeth damaged by injury or gum disease, our professionals offer pain-free and fast dental extractions. While we always endeavour to restore your tooth with fillings, crowns or other solutions, sometimes an extraction is necessary. Based in the heart of Sydney CBD, we make tooth extractions pain-free and simple. With a range of sedation dentistry services plus extensive aftercare and restorative dental treatments, we offer gentle tooth extractions to relieve pain and discomfort. 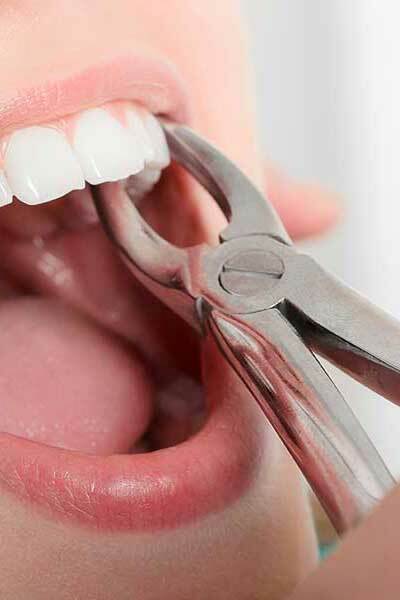 Our dentists understand that tooth extractions can be extremely stressful and overwhelming for some patients. We’re sensitive to the fact that dentists aren’t a pleasant experience for everyone, so we go above and beyond to make you feel comfortable and relaxed. Right from the beginning, your dentist explains all procedures, results and risks thoroughly. You then have the opportunity to ask as many questions as you like to ensure that you’re completely comfortable. Even after a consultation, we strongly recommend that you call our practice should any questions pop up at any time. For some dental extractions, sedation dentistry is recommended to comfortably complete the procedure. For others, we might recommend it to minimise stress, pain and discomfort as you will have no recollection or memory of the procedure. With sedation dentistry, our Pitt St Dental Centre professionals ensure that you won’t feel a thing. Dental sedation means that you feel no pain, discomfort or stress thanks to specially administered anaesthetics monitored by a highly trained professional. There are generally minimal risks and complications associated with sedation dentistry. Your dentist will explain the entire procedure with you, including what happens during sedation, thoroughly before commencement. After you’ve had a tooth, or a number of teeth, extracted, it’s important to follow dentist instructions to reduce inflammation and pain. Your dentist will provide you, and sometimes your guardian, with comprehensive aftercare instructions to ensure a quick and simple recovery. Following a tooth extraction, our dental team will guide you through the range of treatment options for replacing your lost tooth. Depending on your lifestyle and requirements, solutions may include dental implants, fixed bridges or dentures. For restorative dental solutions following a tooth extraction, we work with you to select the most appropriate and low maintenance option for a natural-looking smile. At Pitt St Dental Centre, our dentists and dental hygienists are committed to minimising the need for dental extractions. Throughout all check ups and dental services, we emphasise the importance of preventative dentistry and maintaining good oral health. By regular brushing, flossing and attending twice yearly check ups and professional cleans, you can minimise your risk of gum disease and dental problems. When tooth extractions are required, the experienced dentists at Pitt St Dental Centre offer fast and pain-free services. Guiding you through the entire process with expertise, we ensure a comfortable and positive dental experience. With flexible payment plans available, book a consultation with our Sydney dentists to discuss any of your dental concerns.